NRM - The model railway website dedicated to beginners and those returning to the hobby, with basic and advanced model railway information on all aspects of the model railway hobby. We have produced a complete list of Hornby Model Railway's new 2018 range including the additions of May 2018 can be viewed here on NRM including all new Steam, Diesel and Electric locomotives, Coaches, Wagons and Skaledale. Another year, another complete list of Hornby Model Railway's new 2016 range that can be viewed here on NRM including all new Steam, Diesel and Electric locomotives, Coaches, Wagons and Skaledale. This year to the disappointment of many a collector, there is no Hornby 2016 Catalogue. A complete list of Hornby Model Railway new 2015 range can be viewed here on NRM including all new Steam / Diesel / Electric locomotives, Coaches, Wagons, Skaledale. Also includes the mid year announcement of the return of the Thomas The Tank Engine Range. 21 December 2013 Hornby's new 2014 range can be viewed here on NRM including all new Steam / Diesel / Electric locomotives, Coaches, Wagons, Skaledale, and as well as a few surprises. Click here for the Hornby 2014 pages. 18th October 2009 The scenery pages have been given a facelift and the model railway hills page has been updated. 29th September 2009 Mr Brown has written more locomotive reviews for NRM this time for the Hornby Drummond T9 'Greyhound'' steam locomotive and the Hornby J83 Tank locomotive. 21st August 2009 Mr Brown has written some locomotive reviews for NRM on the Hornby 'Princess Royal' Class Pacific steam locomotive, the Hornby N15 'Ling Arthur' steam locomotive and the Bachmann J39 steam locomotive. 20th December 2008 In a break from the traditional 1st of January release date, the Hornby 2009 range will be announced here at 00:00 hours on the 25th December 2008 (Christmas Day). Please check back then. Click here for the Hornby 2009 pages. 25th August 2008 NRM has completed another load of Hornby Skaledale model railway scenery products including Harold's Larder Corner Terraced Shop, East Water Tower, Lock Keepers Cottage, Country Police Station, and Farm Tractor/Plough Shed. click here for the full list. 24th August 2008 NRM has updated the Electronic Lights page. Click here to read. 3rd July 2008 NRM has completed another load of Hornby Skaledale model railway scenery products including Big Bins, Coal Hopper, East Station, Modern Street Lamps, Platform Shelter, Police Box, Signal Box, and Taxi Rank Office, click here for the full list. 2nd July 2008 Daniel Hull has written two new model railway locomotive reviews for NRM. A review of the Bachmann BR 9F locomotive and the Bachmann BR Standard 76000 4MT Locomotive. 23rd March 2008 The point motor page has been updated with the addition of two new pages. The first is a page coving all the possible places you can fit your point motors and the second is an article written by "Edward Holmes" on how to fit a point motor under your model railway layout. 5th January 2008 The full Hornby Model Railway 2008 list is now documented on the NRM along with some analysis of the range. These pages will be added to as more information is released. Click here for the Hornby 2008 pages. 16th December 2007 With the release of the new Bachmann DCC Controller (EZ Command Dynamis) being only a few weeks ago, NRM forum member Raider has given his first impressions of the new unit from the point of view of a DCC Beginner. Click here to read the review. 13th November 2007 NRM has four new model railway reviews for the Hornby Class 06, Class 31 Author "Peak" (forum member), Class 66, and Class 121. More model railway reviews are to follow. 24th June 2007 NRM has two new reviews for the Hornby Model Railway Class 67 and the Hornby Model Railway Virgin Pendolino. The Model Railway Tunnel page has had the addition of an N gauge tunnel article added and the electronics section has an article on Model Railway Infra-Red Control. 24th March 2007 NRM has two new pages covering the subject of Railway Viaducts and Railway Stations in the model railway scenery section. 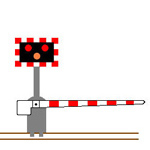 NRM also now has a dedicated page for railway related software including a guild to using XTrkCad model railway track layout design software Author "mumbles and Ironduke" (forum members). More railway software reviews will follow soon. 23 December 2006 As the new year is upon us, so is the announcement of Hornby's 2007 product list. The Hornby 2007 range will be announced on this site at 00:00 hours on the 1st January 2007. Click here for the Hornby 2007 pages. 2nd December 2006 The Hornby Skaledale page has been given a makeover. Each Skaledale model railway review has been given its own page and picture button, which should make it easier to navigate. I have also added some more Skaledale model reviews with more to be added. 28 October 2006 I would like to announce that the model railway electronics page has had an update. Each topic has been given its own page and I have added some new topics. I have also added some Hornby Skaledale reviews and a review of the new Hornby 08 Shunter. 16 August 2006 (mikol) has written an article on making model railway scenery rock faces out of strips of polystyrene. click here to read this article. 8 July 2006 Rob (Ironduke) has written an article about model railway electrofrog points Vs more standard insulfrogs points. click here to read this article. 27 May 2006 Mark (Transrail) great articles on "How to Respray your Model Railway Locomotives" have now been moved to the main site and are available from the locomotive modification page. 6 April 2006 The winner of March's (no winners for February) "best model railway photo" is Andrew H. click here to see his photo. He has won £10 (+£2 p&p) off any purchase from New Modellers Railway Shop. 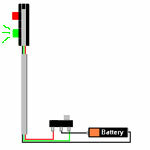 5 April 2006 I have been asked a few times how to motorise a Hornby model railway signal, so I came up with this solution to use a new point motor. click here to read how. 1 April 2006 Finally after a bit of an absence I have had time to add some new articles to the site. Rebecca has written some reviews on Hornby Skaledale models and will hopefully add some more later this month. click here to read the reviews. 17 February 2006 Dave777 has provided this website with the definitive guide to model railway shelf layouts. His article covers all aspects of a shelf layout and terminus-to-fiddleyard, and his article is fully annotated with pictures and drawings, showing possible designs for such a layout. Click here to read his article. 5 February 2006 The winner of Januarys (no winners for December) "best model railway photo" is The Mad Hatters father and son team! Steve & Matthew click here to see their photo. They has won a track cleaning car from New Modellers Shop. 20 January 2006 I would like to announce a couple of new model railway scenery pages. Richard Lloyd has produced a resource article with pictures of different kinds of railway bridges, with some advice on how to model them, and I am documenting the creation of my model railway tunnel as it gets built. New Railway Modellers is trying to build a review data base, built on railway modellers personal experience. The best reviews will receive a free gift. New Railway Modellers is looking for a sponsor / advertiser. We can display advertising on any of our pages for a small fee. New Railway Modellers wants to hear from its readers. New Railway Modellers is a model railway site dedicated to beginners, with model railway advice, help, information, hint and tips to help you build a better model railway layout. This site deals predominantly with Hornby, Lima, Bachmann, Heljan, PECO and Gaugemaster products for OO gauge railway modelling, but much of the information is compatible with different gauges, countries and manufacturers. In the forums you will find a community of railway modellers discussing their layouts, asking questions and giving advice. If you need help and you cant find an answer within these model railway pages, simply post your problem in the forum and you should get an answer. 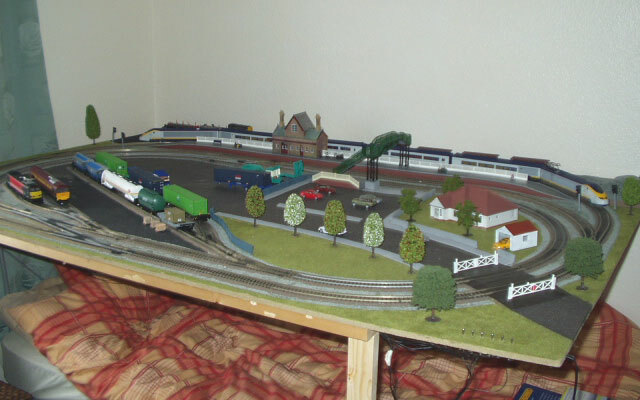 This model railway site covers everything needed to build and design a model railway layout. It includes costs, tools, baseboard construction, designing and building a layout, track, electronics, scenery and rolling stock as well as how to maintain your layout, locomotives and track. The scenery page covers the construction of plastic kits, hills, inclines, and buildings and also covers ballasting, tarmac,grass, and water effects for your model railway. Please remember this model railway site is always being added too as my experience increases and new model railway products are brought to the market, so keep coming back and checking out what's new!